The species is broadly distributed in the temperate zone of the Palearctic from Portugal in the west to the Russian Far East in the east. The taxonomic status of the species in Armenia is not yet clarified. It is supposed that the country is inhabited by subspecies H. l. zuvandica Samodurow, Korolew & Tschikolowez, 1996, which occupies wide variety of grasslands between 400 and 2700 m a.s.l. However, some populations are clearly different and require further taxonomic studies. The Dusky Meadow Brown uses various grasses as host-plants. The species flies in one annual generation, and the butterflies are recorded from late May till mid September. The species is slightly uncommon within typical habitat, and its population trend between 2003 and 2013 shows stability (p>0.05), which can be justified by adaptability of the species, which can change the host-plants and survive under anthropogenic pressure. The species is not included in the IUCN and National Red Lists, as well as not included in CITES and Bern Conventions; however it was evaluated for European Red Book as Least Concern, the same status which is proposed for Armenia. 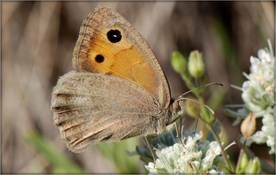 Dusky Meadow Brown can be found in almost all the Protected Areas, Emerald Sites, and Prime Butterfly Areas. Apparently there is no need for development of additional conservation measures. However its monitoring remains important as well as there is a necessity for taxonomic studies of its populations.